2018 - This winter thanks to your generousity in the 2018 Archdiocesean Annual Appeal, the St. Hubert parish was able to install a new roof for there church. Please see the two videos below of the roof installation. Thank you for your generousity! In Haiti, the data on malnutrition, infectious diseases and illiteracy are alarming. 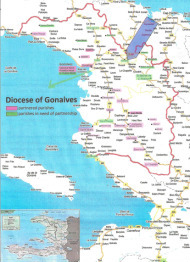 In an effort to reach out to our sisters and brothers in Haiti the Archdiocese of Baltimore began a sister diocese relationship with the Diocese of Gonaives in 1997. 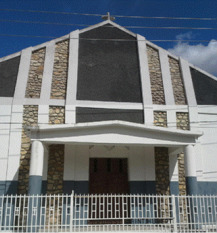 Parishes within our Archdiocese are encouraged to establish sister parish relationships with parishes within the Diocese of Gonaives. Our parish has begun to develop a partnership that assists the St. Hubert parish communities to be spiritually healthy, physically strong, and to relieve the daily sufferings of the community. You can read about the development of the partnership in the brochure found here. Click here for photos from Haiti and St. Hubert's parish. Fr. Keith led our first delegation to visit our sister parish in Haiti from February 26-29, 2016. This was an exciting step towards furthering our sister parish project. Beyond sharing our prayers with the community there, our delegation brough much needed medical supplies to support a five day clinic held at the parish which treated over 400 people. Click here for photos from the clinic. Click here for photos from the delegation visit. One of the primary needs identified by Fr. Faubert for the communities served by St. Hubert's parish was the training of lay ministers who would be able to travel among the farflung chapel communities and attend to the pastoral needs of the people. A portion of our parish's donated funds were used for the training of the first of these lay ministers who are now working with Fr. Faubert.